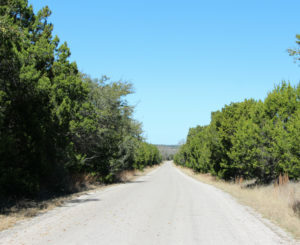 I turned off Texas Highway 190 near San Saba, Texas onto a county road tightly framed by Juniper and scrub Live Oaks. That road quickly turned to a winding dirt road that led down to the Colorado River bottom. A few more twists and turns down the narrower dirt roads revealed the telltale signs of a working Sandstone quarry. Dust rose over the piles of reddish rock and the sun glinted off metal sheds protecting stone saws and hydraulic choppers. Sandstone is mainly composed of sand-size mineral or rock grains, most sandstone is primarily quartz and feldspar, which are two of the most common minerals in the earth’s crust. Like sand, it can be any color, but most commonly comes in tan, brown, yellow, red, gray and white. The stone usually has a uniform texture and it is somewhat soft, making it user-friendly for a variety of applications. It is favored for wall claddings and flooring because of its low absorption rate, high compression strength, and pleasing appearance. Learn more about Sandstone’s properties and uses at the Building Stone Institute. Nerri, the quarry manager and a 12 year employee of Espinoza Stone, Inc., met me at the stone saws and drove me down to the beds where Sandstone slabs were being harvested. On the way to the active beds, Nerri stopped so I could take pictures of the stone layers exposed from previous Sandstone mining. We walked down to a quarry wall where large amounts of soil and rock covering the Sandstone deposits were clearly visible. In mining terms, this layer is called the Overburden. 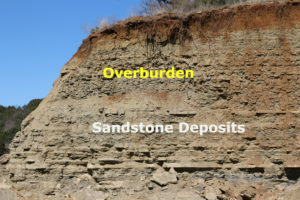 Beneath the overburden, different layers of stone deposits were visible. We walked down to an active quarry bed where a large loader was breaking out slabs of Red Sandstone. The loader seemed to lift the slabs out very easily. 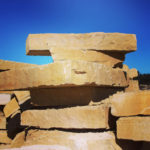 Sandstone is quarried differently from the Central Texas Limestone pits where large diamond-tipped blades saw checkerboard patterns into Limestone beds and excavators hammer the blocks free. 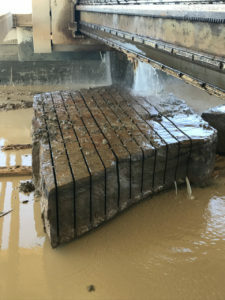 Back at the metal saw shed, two large stone saws sliced Sandstone slabs into pieces suitable for chopping. 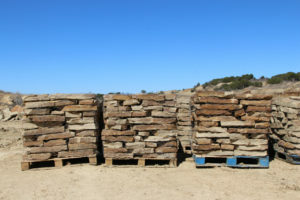 The chopped stone is moved to a staging area where the pieces are sorted by size, mixed, stacked on pallets and secured for transport. Flagstone pieces may be broken by hand in this area as well as separated again into ledgestone and patio stone pieces. Semi trucks are loaded in the quarry for transport to building sites, distributors and further processing. Much of the stone produced from the San Saba mine will be mixed with Limestone and Leuders to create signature stone blends or thin veneer building stone. Thanks for joining our walk through a Texas Sandstone Quarry and checking out our new blog.